Former member of parliament and retired Navy Chief of Staff Rear Admiral Sarath Weerasekera has sought an explanation from UNSG Sri Lanka panel member, South African human rights lawyer Yasmin Sooka as regards sharp discrepancy in the much-touted UN Vanni death toll and the British wartime dispatches from its diplomatic mission in Colombo. Weerasekera has challenged the International Truth and Justice Project’s (ITJP) executive director Sooka at a side event at the Geneva-based United Nations Human Rights Council (UNHRC) on Thursday (March 15). Sooka has asserted that numbers didn’t matter and refrained from responding to the specific query raised by Weerasekera, who made an intervention at a discussion titled ‘Combating Impunity in Sri Lanka’ meant to highlight war crimes allegations directed at wartime Vanni Security Forces Commander the then Maj. Gen. Jagath Jayasooriya. The UNSG panel comprised one-time Indonesian Attorney General Marzuki Darusman, US lawyer Steven R. Ratner and Sooka. Weerasekera has stepped in after Sooka alleged that the Sri Lankan military massacred over 150,000 though the UN panel estimated the number of civilian deaths at 40,000. Side events take place on the sidelines of Geneva sessions scheduled to continue till March 26. Former President Mahinda Rajapaksa’s government brought the war to a successful conclusion in May 2009. The Global Sri Lanka Forum (GSLF) has fielded a team in Geneva to counter anti-Sri Lanka propaganda in the absence of government initiative. Zooka’s team at Geneva meet included Carlos Castresana Fernández, public prosecutor, Spanish Supreme Court and former British diplomat Ann Hannah, Acting Director of Policy and Advocacy, Freedom from Torture. The panel called for universal jurisdiction in Jayasuriya’s case. Weerasekera has asked how the UN continued to justify over 40,000 deaths regardless of Lord Naseby’s disclosure in UK parliament last Oct based on unquestionable British military dispatches from Colombo. The naval veteran pointed out that British reports tallied with a comprehensive UN report that dealt with Vanni death toll from Aug 2008 to May 2009. The then British defence attache here Lt. Colonel Anthony Gash estimated the number of dead at 8,000 with one fourth of them being LTTE personnel. The UN report placed the number of dead, both combatants and civilians at 7,721 by May 13, 2009. The audience was reminded by Weerasekera how international military experts had challenged the UNSG report. Weerasekera has asked whether Sooka was making an effort to justify the flawed UNSG panel report by moving court in Brazil in respect of war crimes allegations against Jayasuriya in 2017. Jayasuriya, returned to Colombo on completion of his term as Sri Lanka’s Ambassador in Brazil in the wake Sooka moving court against one-time Army Chief. Weerasekera yesterday told The Island that the Sirisena-Wickremesinghe government owed an explanation to the country as to why absolutely no effort was made to disprove lies propagated in support of the Geneva project. An irate Weerasekera said that Sooka’s sidekick Carlos remained mum when he was reminded that he accused Sri Lankan military of war crimes even without setting foot in the country. Weerasekera has challenged the Spanish national to justify his declaration that Sri Lanka deserved to be charged for war crimes due to what he called overwhelming evidence of deliberate civilian killings. Weerasekera has pointed out that international experts, including Maj. Gen. John Homes (British Army) cleared Sri Lanka of war crimes after having visited Sri Lanka. Weerasekera alleged that the government lacked a cohesive plan to defend the country. The previous government allowed battlefield commanders to be interviewed by foreign experts. A Canadian Tamil participant has accused Weerasekera of being in charge of the Navy at a time sailors bombed Point Pedro. The Canadian claimed that at the time of that incident he was small but remembered the navy carrying out the attack. Weerasekera has asked Carlos whether such blatant lies were considered as overwhelming evidence against the Sri Lankan military. Weerasekera has told the gathering that those who lived in luxury in the Western world pursued anti-Sri Lanka campaign and the Canadian Tamil was one such person. On the previous day, March 14, Weerasekera requested the Geneva body to suspend implementation of Resolution 30/1 pending reappraisal of the circumstances leading to Sri Lanka co-sponsoring the controversial proposal. The following is the text of Weerasekera’s statement received by The Island courtesy GSLF: “Today we speak about the human right situations that require council’s attention. The High Commissioner in his report A/HRC/37/23 on Sri Lanka updates the Council on Sri Lanka’s implementation of resolution 30/1. My remarks pertain to the High Commissioner’s report. In March 2017, I filed two reports which conclusively rebutted the OISL report of the High Commissioner which alleged that Sri Lankan forces committed war crimes. The OISL report is the basis for resolution 30/1. The foreign Minister of the SL government co-sponsored the resolution without the approval of the President and the Parliament of Sri lanka. Continuing to implement a resolution based on a flawed report is a breach of the principles of the UN Charter, and therefore a grave violation of the human rights of all Sri Lankans. 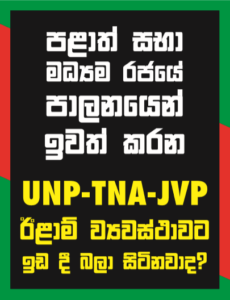 It is the People of Sri Lanka who have to ultimately suffer the consequences of ill-advised UNHRC resolutions. The Human Rights Council is not above the law. Having exhausted all my options in bringing this situation to the attention of the Council, I have filed a Complaint Procedures petition. Normally, the Complaint Procedures mechanism is used against States, but I have adduced cogent reasons why the mechanism must cover complaints against the UNHRC or the OHCHR.